Jill DeGroff has visited all the best bars of the world - she’s the one off to the side quietly sketching away while hubby holds court. 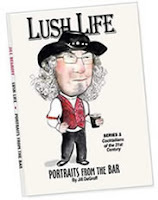 Now we can all see what she’s been up to, as the release is here of Lush Life; Portraits from the Bar. Parties will be held in several cities, featuring culinary cocktails prepared by award-winning mixologists, and she will be signing books and rendering a few caricatures. The tour started in Boston, and she’ll be in New Brunswick, N.J. Nov. 8 at Stage Left , and then on to D.C., NYC and San Francisco — check here for her current schedule.